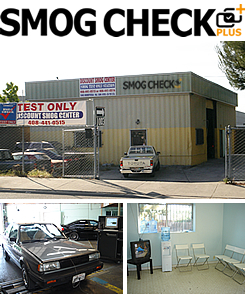 $29.75* San Jose Smog Check Coupon - Smog Check Plus - 1003 Berryessa Rd., San Jose, CA. Phone: (408) 441-0515. Local San Jose Smog Station. Shop Hours: MON - FRI 9:00am to 6:00pm. SAT 9:00am to 5:00pm. No appointment needed! Smog Special: Get your smog test for ONLY $29.75*. Plus get one free retest if you're vehicle doesn't pass the first test. *Discount applies to 2000 & newer vehicles and regular smogs. + $8.25 CA smog certificate fee. Must present coupon prior to smog test. More certified smog station near San Jose, CA.